CALLAWAY RESORT & GARDENS offers exciting activities and seasonal events for all ages, plus exceptional accommodations and cuisine. A Family Summer Camp, golf, spa, butterfly center, biking, fishing and much more! Daily Gardens Admission INCLUDED in overnight stays is the top-rated benefit for our Reunion Guests! Ask about our remarkable reunion packages when you call. 60 minutes from the ATL International Airport in beautiful Pine Mountain, GA 31822. Unplug, then reconnect. Conveniently located minutes from Atlanta, Sandy Springs, Georgia has 20 hotels and more than 50,000 square feet of meeting space. 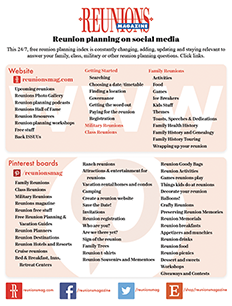 Contact us today to start planning your reunion in Sandy Springs!